Cover shots of the four books discussed below. Adventures in Human Being: A Grand Tour from the Cranium to the Calcaneum by Gavin Francis. London: Profile Books (in association with the Wellcome Collection). Having previously read Francis’s book on being a doctor in Antarctica and knowing that he has accrued a wealth of knowledge and experience of treating the body from a medical viewpoint in a wide variety of countries, I was intrigued to see this new publication by him, which focuses on different sections of the body as a jumping off point for the essays in this collection. I’d recently read Tiffany Watt Smith’s The Book of Human Emotions: An Encyclopedia from Anger to Wanderlust (which, coincidentally, is also published by Profile Books and the Wellcome Collection), which introduces over 150 different human emotions in an exciting combination of psychological, anthropological, historical and etymological mini essays on the human condition. It was a thoughtful book and made me wonder about how we approach the body in bioarchaeology, whether our lexical terminology isolates and intimidates, frustrates and alienates those who we seek to engage and educate. The Book of Human Emotions succinctly highlighted what we think is the universal, the standard charge sheet of emotions (anger, fear, joy, love, etc.) that can be found in cultures across the world, is actually not quite the case or clear-cut, and that they can be expressed and felt in different ways. Francis’s book, I think, will also offer something as equally as thought-provoking. Known not just for his medical expertise but also for the humanity of his writing, Francis’s exploration of the body, as a story we can each call our own, delves into the medical, philosophical and literature worlds to uncover the inner workings of the human body, in good health, in illness and in death. Crucial Interventions: An Illustrated Treatise on the Principles and Practices of Nineteenth-Century Surgery by Richard Barnett. London: Thames & Hudson (in association with the Wellcome Collection). I came across the above book purely by chance whilst out browsing bookstores in York recently and I have to say it is now on my festive wish list. The medical historian Richard Barnett introduces a publication detailing the knowledge and variety of surgical practices available to the 19th century surgeon, focused largely on the presentation of the technical drawings produced in the era as a precise method for communicating the advancements made in a variety of treatments. The publication introduces some of the earliest effective surgical techniques for dealing with devastating facial and limb injuries, either from disease processes, traumatic incidents or the outcomes of warfare, and documents the procedures used in re-configuring the body to alleviate the pain and the disfigurement suffered from such injuries and traumas. It may not be for the faint of heart, but I could see that some modern-day surgeons may be interested to learn of past techniques, the tools and resources that they had, and the importance of always improving and building upon the innovations of the past. Bioarchaeology: An integrated Approach to Working with Human Remains by Debra L. Martin, Ryan P. Harrod & Ventura R. Pérez. New York: Springer. For any undergraduate or postgraduate student of archaeology that has a burgeoning interest in biarchaeology as a profession, I’d heavily encourage them (and the department) to get a copy of Bioarchaeology: An Integrated Approach to Working with Human Remains by Martin, et al. The volume concisely introduces the discipline and outlines the background to it, the theories and methodologies that have informed the theoretical and practical application of bioarchaeology, the current state of play with regards to legal and ethical frameworks, and, finally, the impact and the importance of bioarchaeology as a whole. The volume also uses invigorating case studies to elucidate the methods of best practice and the impact of the points made throughout the volume. It is an excellent guide to the discipline and well worth purchasing as a reference book. Furthermore the volume is now out in paperback and it is very handy to have in your backpack, partly as a one stop reference for any theories or methodologies currently used in bioarchaeology but also as a pertinent remainder of the value of what we do as bioarchaeologists and why we do it. Theory and Practice in the Bioarchaeology of Care by Lorna Tilley. New York: Springer (Hardback only at the moment). The post before this one has already detailed the aim and scope of this publication but I feel it is worth highlighting here again. The bioarchaeology of care, and the associated online Index of Care application, aims to provide the bioarchaeologists with the tools for a case study framework for identifying the likelihood of care provision in the archaeological record by providing four stages of analysis in any individual skeleton exhibiting severe physical impairment, as a result of a disease process or acquired trauma. The methodology takes in the importance of palaeopathology (the identification and diagnosis, where possible, of pathological disease processes in skeletal remains which has a firm basis in modern clinical data) but also the archaeological, cultural, geographic and economic contexts, to examine whether receipt of care is evidenced. In the publication Tilley documents and investigates a number of prehistoric case studies, ranging from the Upper Palaeolithic to the Neolithic, and determines the likelihood of care and the type of care that was needed for the individuals under study to survive to their age at death. The theoretical background and implications, alongside the ethical grounding of the methodology and the concerns in terminology, are also documented at length. Perhaps most importantly, this is a methodology that is open to improvement and to the use within current and future research projects. It is also a method that can be used first hand when examining skeletal remains or from the literature itself (where available to a good enough standard). The above publications are, to me, some of the most interesting that I have seen recently, but I am always on the look out for more. Please note that the average costs of the books above are within the £10.00-£20.00 range, but prices will vary significantly. The hardback academic publications can be quite expensive (+ £70), however once the volume is out in paperback the price tends to fall steeply. If you can recommend anything please let me know in the comments below. The University of Durham is playing host to a one day conference entitled Little Lives, focusing on new perspectives on the bioarchaeology of children, both their life course and their health, for the very fair price of £10.00 on the 30th of January 2016. The Facebook group for the conference can be found here. Alternatively contact the conference organizers via the Durham University webpage here to secure a place (something I must do soon!). Please note that the call for papers date has now passed and that the conference program has now been finalized. The Wellcome Trust, which helps operate the Wellcome Collection, is an independent global charity foundation dedicated to improving health by funding biomedical research and medical education. The charity also has a keen focus on the medical humanities and social sciences, and it recognizes the importance of running educational workshops, programs and outreach events. Find out more information on the charity here. Check out Alexandra Ion’s Bodies and Academia blog for her latest post entitled holiday gift ideas for anatomy lovers for more books focused on the human body. I also highly recommend reading Ion’s blog for insights into understanding the human body in archaeology and osteoarchaeology. Further to this check out Ion’s really interesting research into the Francisc I. Rainer human osteological collection in Romania, one of Europe’s largest skeletal collections, held at the Anthropology Institute of the Romanian Academy. The former neuroscientist and current science journalist Mo Costandi has a new article in The Guardian titled Life After Death: The Science of Human Decomposition. It is well worth a read for those interested in how the body changes and starts to break down immediately following death, with new insights into the ecology of death itself. It is well-known that, as the body goes through the initial death and decomposition stages towards skeletonization, it plays host to a wide range of insect life. However it is only really in the past few years that the study of the so-called thanatomicrobiome has really blossomed, particularly with the rise of the ‘body farms’ across the world where human remains can be scientifically studied and sampled in-situ, in a variety of both buried or non-buried contexts which mimic where bodies are found (Can et al. 2014). (Although sadly the United Kingdom still lacks a human body farm, there is an animal body farm at Glywndr University in Wales, created by forensic scientists at the university to study taphonomic change in non-human corpses). There are obvious applications in understanding the mechanisms of the thanatomicrobiome and of the ecology present, particularly with the application of the methods in the forensic sciences in helping to pinpoint the time of death of an individual. As Costandi demonstrates in his remarkable article the human body can be a veritable oasis of life in death, playing host to many species of insect life – this is particularly fascinating for forensic entomologists and anthropologists, but also to bioarchaeologists who work in conditions where the remains, and life stage, of insects can be identified and placed within a certain cycle of decomposition stage, if found within the context of a body. It is also particularly interesting for those who study bioarchaeology as it highlights the differentiation found not just between bodies in the act of decomposition but also throughout the same body itself, and how this can change due to body location and environment. This is highlighted by the observations of certain insects at unexpected places, perhaps taking actions that one would not expect – that is very important for the forensic sciences and bioarchaeological sciences as it can determine the theorised location of the body and if the body has moved after death took place but before retrieval (Lindgren et al. 2015). The action of the gut microbiome also plays a key role in the decomposition of the body as it aids greatly in the decomposition of the body as whole during the biomolecular breakdown of the bodies numerous and varied cells. The composition of it can also vary from person to person. The understanding of the decomposition stages and of the taphonomic sequences in the forensic or archaeological record is thus vital to understanding the context of the body itself; whether this helps to identify if the individual underwent a funerary ritual and/or mortuary processing or to identifying whether the individual was buried in a clandestine or a non-normative manner. Mo Costandi’s article for the Guardian newspaper can be read here. Can, I., Javan, G. T., Pozhitkov, A. E. & Noble, P. A. 2014. Distinctive Thanatomicrobiome Signatures Found in the Blood and Internal Organs of Humans. Journal of Microbiological Methods. 106: 1-7. Lindgren, N. K., Sisson, M. S., Archambeault, A. D., Rahlwes, B. C., Willets, J. R. & Bucheli, S. R. 2015. Four Forensic Entomology Case Studies: Records and Behavioral Observations on Seldom Reported Cadaver Fauna with Notes on Relevant Previous Occurrences and Ecology. Journal of Medical Entomology. 52 (2): 143-150. I recently had the pleasure of visiting Sheffield to take part in an archaeological excavation in the nearby Peak District but, after hearing about the beauty of the Sheffield General Cemetery at the Dearne Valley Archaeology Day 2014 conference, I thought it was time to give the cemetery a visit whilst I was down. With a good friend and my trusty old Pentax S1a camera loaded with black and white film, I set off to take a look. The fully landscaped Sheffield General Cemetery was opened by the Cemetery Company in 1836, a year before Queen Victoria took the throne of Great Britain, in the south-west part of the city on a patch of steeply rising land. 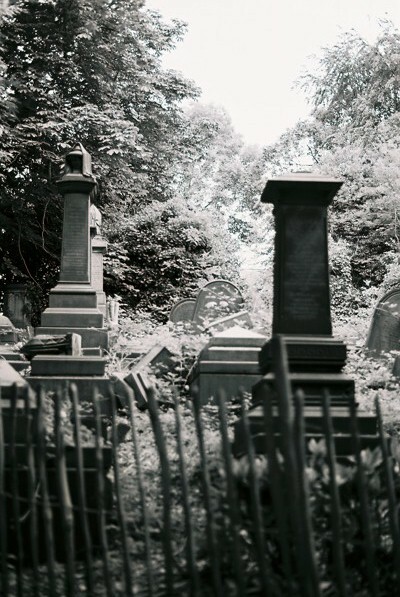 It was closed for burial by Sheffield City Council in 1978. It was constructed in response to the overcrowding and poor conditions that haunted many of Sheffield churchyards in this period of rapid economic and population growth of the city during the industrial revolution, and subsequently extended on the east side in 1846 at the request of the Anglicans (Hartwell 2009). It is a cemetery that is noted for its unique history and architecture – being home to (the unfortunately unpopular) two terraced catacombs, a Gothic-style Anglican chapel, a two-storey Non-conformist chapel with subterranean burial vaults (which was built in the classical style with Egyptian features), and a prominent gatehouse alongside other interesting features (McIntyre & Harvey 2012). It remains an overgrown and poignant home to around 87,000 or so Anglican (Church of England) and Non-conformist inhumations. Individuals were buried throughout the span of the cemetery lifespan, with the majority being buried after the 1855 Burial Grounds Act was passed (Sayer 2012: 29). 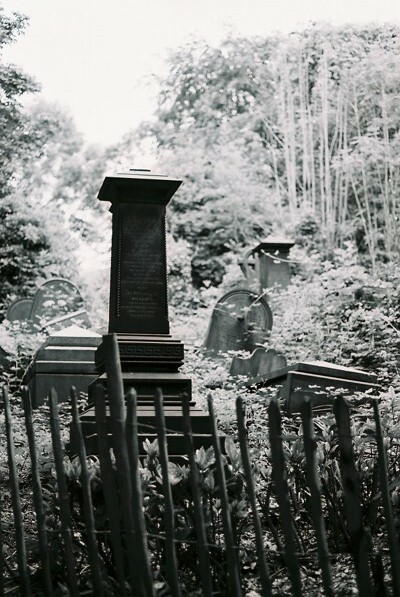 Today the cemetery is open to all to explore the interesting architecture, beautiful grounds and the famous individuals from Sheffield’s past. Although this is just a brief post I highly recommend taking the time to read the sources below and to give the cemetery a visit if you are in the area. It is really is beautiful and serene – perfect for a summer stroll if you are not on an excavation! A moment to pray. 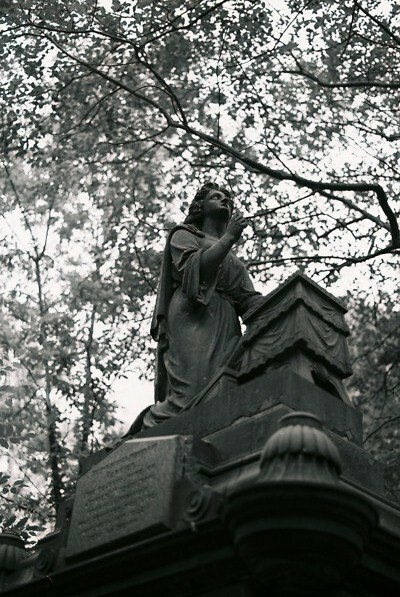 A particularly elegant statue on the top of a grave plot commemorating a family. During the Victorian period it was the vogue for memorial sculptures to hark back to classical antiquity and the Sheffield General Cemetery has many monuments with obvious architectural motifs and influences from the Egyptian, Greek and Roman cultures. Unlike modern cemeteries, and indeed some of the more recent 20th century gravestones at the General Cemetery, Victorians tended to elect for elaborate memorials that commemorated family ties, christian values and the remembrance of the individual; essentially mourning was not hidden from the actual burial or commemoration site (Sayer 2010). A moment to commemorate. This now crumbling monument was installed in the cemetery to honour George Bennet (1773-1841), who was sent around the globe by The London Missionary Society to report and discover the state of ‘Godliness’ around the globe. He spent 8 years (1821-1829) covering the far reaches of the globe, making a total journey of around 90,000 miles before returning home. Although the monument is a dedication to him he was not buried in the cemetery itself (SGCT website). 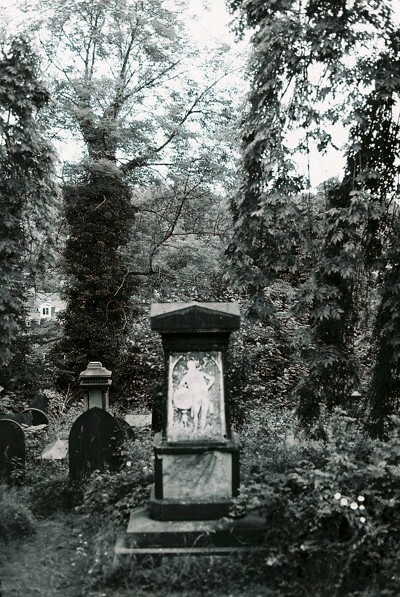 The majority of the monuments at the cemetery can be found in the western Non-conformist area, where many notable citizens of 19th century Sheffield can be found. This includes the grave of Mark Firth (1819-1880) who was a steel industrialist, philanthropist, and the founder of Firth College in 1870 (which later became the basis for The University of Sheffield). Many of the monument’s fencing in the cemetery is made of Sheffield steel and remain fairly intact to this day, although larger monuments themselves and the Non-conformist chapel have suffered damage and neglect (McIntyre & Harvey 2012: 2). The fenced off plots of Non-conformist graves awaiting restoration and conservation. In this particular area many of the gravestones and monuments have been crowded together and are slowly being covered by vegetation. Although closed for burial in 1978 Sheffield City Council still own the site and it became run down in the 80’s and 90’s, however it is now managed by the Sheffield General Cemetery Trust (formerly known as the Friends of the General Cemetery). The Trust is a charity organisation which was formed in 1989 and its aim is to help conserve the cemetery, run educational tours and workshops, and help in the historical research of the cemetery’s architecture and occupants. The cemetery and the landscape is listed as a Grade II* building environment by English heritage, and it is also home to a designated Local Nature Reserve. A different view of the above, showing an uphill shot of crowded monuments and gravestones that mark burials. A portion of the Anglican area of the cemetery was leveled of gravestones and markers in 1980, which cleared some 800 markers, to make a playing field (Hartwell 2009). A number of these, and some of the older gravestones that had fallen or become rubble, were used in the construction of rain clearways or pathways. The cemetery is also home to individuals who have died during pivotal points in the city’s history. This includes victims from the great Sheffield flood of 1864 when 270 people were killed when a reservoir dam breached uphill, soldiers from the First World War (a war which helped influence a change in style towards simpler memorials in the western world), and people killed during the blitz from the Second World War where a total of 700 people died in Sheffield, some of whom were buried in the General Cemetery (SGCT). Silently guarding his home. This bear doesn’t belong in the Sheffield General Cemetery but comes from the nearby Sheffield Botanical Gardens, which was founded in 1836, the same year as Sheffield General Cemetery. The Anglican side of the Sheffield general Cemetery (designed and extended in 1846) was designed by Robert Marnock, who also designed the Sheffield Botanical Gardens (Hartwell 2009). The botanical gardens hosts a wide range of flora from each corner of the globe and covers a grand total of 19 acres. 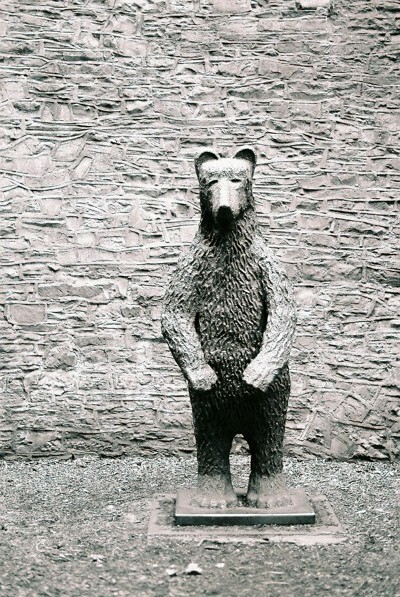 The bear pit in the botanical gardens was home to a duo of brown bears that entertained the public from 1836 until the 1870’s when a tragic accident involving a boy falling into the pit and being killed resulted in their removal from it (source). The pit itself was particularly small and I can only imagine the stress that the bears themselves must have felt. Today the botanical gardens remain open and free to the public and are a popular attraction on a summer day. It is worth mentioning here that during the Victorian and post-Victorian periods there were many different Burial Act Laws initiated and implemented, which have subsequently heavily influenced the approach and actual access that archaeologists have during planning processes and exhumation of human remains in many of the UK’s urban areas. This is an ongoing source of contention and conflict between heritage bodies, contractors, the public and the government, and it remains likely to continue to be so in the future (Parker-Pearson et al. 2011: 819, but also see here with regards to exhumation and burial law). Unfortunately I only had one roll of black and white film and I wanted to save some film for something else which, tantalizingly, will follow this post! The Sheffield General Cemetery Trust website can be found here, where a record of both the history of the site and of the individuals buried at the cemetery can be accessed. The Urban Ghosts website has a fantastic selection of photographs, including of the Non-conformist chapel and views of the terraced catacombs, and information on the cemetery here. A list of common symbols on Victorian graves and their meanings can be found here. Read about just why the cemetery and park is listed as a Grade II* building by English Heritage here. Delve into the delights of the Sheffield Botanical Gardens, where the bear pit and curvilinear Glass Pavilions are also Grade II and II* listed buildings, here. Over at Spoilheap Sue Anderson has a very considered and enlightening range of issues that should be taken into account regarding the legal aspects of burial archaeology. Hartwell, C. 2009. Sheffield General Cemetery (List Number 1001391), English Heritage List Entry Summary. Accessed 25th July 2014. (Open Access). McIntyre, L. & Harvey, L. 2012. Non-Conformist Crypt Survey, General Cemetery, Sheffield. Report No. GCN01. The University of Sheffield. Unpublished report. (Open Access). Pearson, M.P., Schadla-Hall, T. & Moshenska, G. 2011. Resolving the Human Remains Crisis in British Archaeology. Papers from the Institute of Archaeology. 21: 5-9. (Open Access).